Satyananda Yoga is an integral yoga developed by Swami Satyananda Saraswati which is based firmly in tradition and provides a systematic and comprehensive approach to living in the modern world. It presents the ancient teachings of yoga in a simple but scientific and systematic manner. But how exactly is Satyananda Yoga different? Each disciple of Swami Satyananda has his interpretation of the difference. Yoga has its origins in Tantra as well as the Vedas, bodies of ancient Indian knowledge dating back many thousands of years. A few decades ago it was believed that yoga was only a philosophy and a discipline meant to strengthen the spirit, mind, body and life of a chosen few. People concluded ( and some still do) that to persue a life of reflection and meditation one had to renounce social needs and desires. 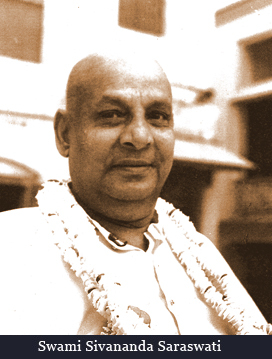 It was Swami Sivananda, our paramguru, who broke with tradition and moved yoga from being a restricted philosophy to a practical method of developing one’s life by teaching all the different types of yoga found in the scriptures to his disciples. Swami Satyananda codified his teachings and developed an integrated yoga by combining the tantric aspects of yoga ( kundalini, kriya and mantra yogas; concentration, introversion, meditation) with the vedantic aspects ( bhakti, jnana and karma yogas; chakra system). The process took more than a decade, developed and modified as Swami Satyananda traveled throughout India with the purpose of understanding, experientially, the needs of society. The result is a yoga which is balanced, practical and can be seamlessly integrated into today’s lifestyle. More importantly, it is an evolving form of yoga, being constantly researched and modified at the Bihar School of Yoga under the guidance of Swami Niranjananand Saraswati, our guru.